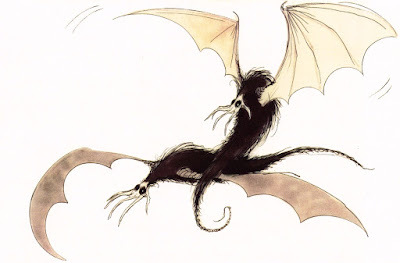 This is the drawing that ended Tim Burton's career as a Disney Feature Animation artist. Tim had produced endless designs for The Black Cauldron, all of them in his unique, personal style. When it came time to come up with a look for the monster birds, the Gwythaints, most of us thought of conventional dragons types that would look for and kidnap the oracular pig Hen Wen. Tim had this great idea for bat-like creatures with a hand shaped head. Everybody was pretty excited about this unusual idea, including myself. But in the end the producers commented that it reminded them of the surreal 1968 animated film Yellow Submarine, a style they deemed inappropriate for The Black Cauldron. Tim left the production shortly thereafter, and produced a beautiful animated short stop motion film called Vincent. It wasn't until after he left Disney that he became THE Tim Burton, when he was given the chance to put his mark on many live action as well as animated films alike.